Earlier this year I shared the amazing work of New Milford High School student Sarah Almeda in a post titled Students Yearn For Creativity, Not Tests. Wherever I now speak across the country and soon the world I share the incredible project Sarah created. Her passion for the arts and creativity serve as an catalyst for her learning. She has capitalized on the concept of student voice, taken ownership of her learning, and become an inspiration for me and countless other educators and students across the world. I am always in awe of the art that she creates using a variety of mediums to demonstrate conceptual mastery. It is these artifacts after all that truly measure the construction of new knowledge as well as both skill attainment and application. So what does an amazing student like Sarah do over the summer? She creates amazing art as a means to continually demonstrate her passions while learning new skills and techniques in the process. Above is a picture of her entry into the 2014 Cover Contest held by Creative Outlook, a free magazine distributed to high school teachers and students immersed in art and music. 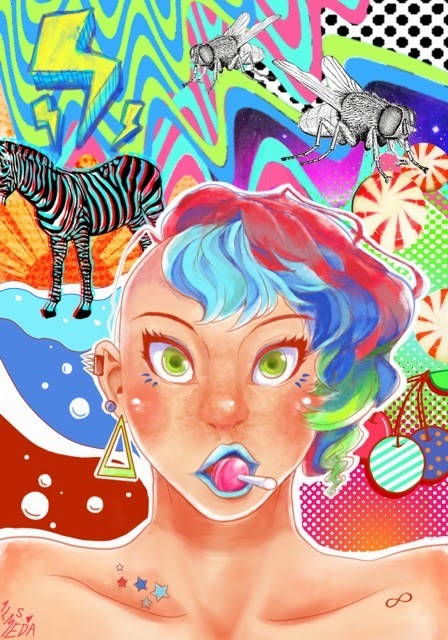 She used her self-taught knowledge of Photoshop, bitmap generation, image distortion, photo-manipulation, digital painting, graphics tablet, and an iPhone to make it. I’m trying to share her entry with as many people as possible as only the top 10 entries that get the most votes will enter the final stage of judging. As Sarah took the time over the summer to share her work with me I have made the decision to reach out to my network to see if you can lend her a hand to get to the judging stage. I hope you’ll vote HERE for Sarah and consider sharing her amazing work! Regardless of how the contest turns out Sarah's desire to follow her passions and push her learning boundaries make her a winner in my book. Her true reward has been the construction of new knowledge and the acquisition of new schools that will aid her as she pursues a future career in game design. She consciously makes the decision to learn over the summer, which is why she is an amazing student. I can't wait to see what work she shares with me once the school year starts.